While it’s true that wayfinding is about helping people get to where they want to go, it also boasts benefits to brand enhancements and key destinations. In a world where cities are quickly and easily navigated with a smartphone and information can be found within minutes, how is physical wayfinding necessary? Wayfinding in urban landscapes proves to be – perhaps surprisingly – critical beyond basic navigation. Identification and information represented in elements such as monuments, directional systems, directories, interpretive and even regulatory signs enrich our experiences with urban environments. 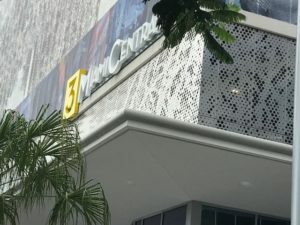 As such, in order to create a successful wayfinding system, the Sign Research Foundation argues that even in an age of smartphones and GPS, physical wayfinding elements and systems strengthen brands by improving the legibility, navigation, understanding, and accessibility of the environment. Consider, for example, the case for Cascades Park, the new social center in Tallahassee, Florida. The goal of the park is to bring arts, entertainment, education, history, and wellness together in one social center in the heart of downtown. Boasting a variety of outdoor and recreational amenities, Cascades Park includes 2.3 miles of biking and walking trails, an outdoor amphitheater, an interactive water fountain, a children’s play area, a Smokey Hollow Commemoration, and a stormwater facility designed to flood for relief to nearby areas during major storm events. The park’s wayfinding signage included gateway monument signs with a map and highlighted features, stainless steel etched panels for dedication plaques, and monuments depicting the history of the property and the City of Tallahassee. Further, parking signage with themed finials to indicate the appropriate parking areas and parking hours was included, as well as donor plaques and pedestrian directional signs located at intersections throughout the park with an information/map cabinet with interchangeable copy. 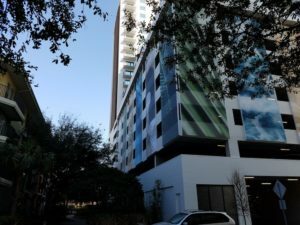 In terms of signage as art, consider the example of 500 Harbour Island, a premier 230-unit high-rise located in Downtown Tampa, which seeks to reset the urban landscape standard for Tampa Bay. Leading the transformation and vision in architecture for multifamily, this project transformed an urban parking garage into captivating artwork using architectural elements, such as digitally printed mesh banners that completely transformed its aesthetics. Its design elements continue through the use of stainless-steel reverse-lit channel letters, soft white illumination, and three-layer fabrication for the amenity and front-of-house signs, including an acrylic backer with additional layers of wood laminate and brushed aluminum. Urban wayfinding systems do far more than tell vehicles and pedestrians, ‘You are here.’ They enhance every city’s urban brand by improving the legibility, navigation, understanding, and accessibility of the environment, and serve to reinforce the history, architecture, and landmarks that define it. Further, urban wayfinding systems create and reinforce destination hierarchy, enhancing the identification and utilization of lesser-known destinations and districts, improve traffic flows, safety and ease in finding parking and allowing vehicular traffic to transition for pedestrian and transit use, and reduce visual clutter with a consistent urban brand identity and character. While it’s easy to overlook the less obvious value of urban wayfinding in the digital age, its benefits can’t be overstated. A teaching tool that educates the visitor on the boundaries, destinations and key features of the urban environment, urban wayfinding creates a ‘legible city’ where its elements support the overall urban structure and experience and help to sustain economic viability. 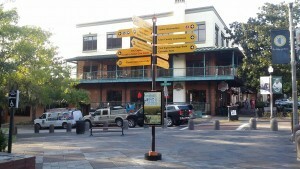 Contact us today to learn more about incorporating urban wayfinding elements into your next project.